“The Roaring ’20s.” “The Summer Of Love.” “The Me Decade.” These are terms that retroactively came to represent a host of cultural signifiers of a specific time and place. And someday, decades from now, historians will assign a shorthand title to this era in American history as well. This year—and probably a number of the surrounding years, both preceding and following this moment in time—will be known as “The pinnacle of human history,” because Grumpy Cat is getting her very own wax figure at Madame Tussauds. To be more precise, she’ll be getting her very own animatronic statue that will be able to perform five different movements, according to Business Wire. The statue will debut later this year at the Madame Tussauds in San Francisco, with Grumpy Cat herself doing the unveiling. From there, it will tour the other five locations in the U.S. to ensure that everyone can be within several thousand miles of a robotic figure of a frowning feline, if only for a beautiful, fleeting moment in time. “This is truly an honor,” said a press release that was 100 percent written and composed by a cat. “I hate it.” Which is funny, because she’s always frowning! It’s like she hates everything! 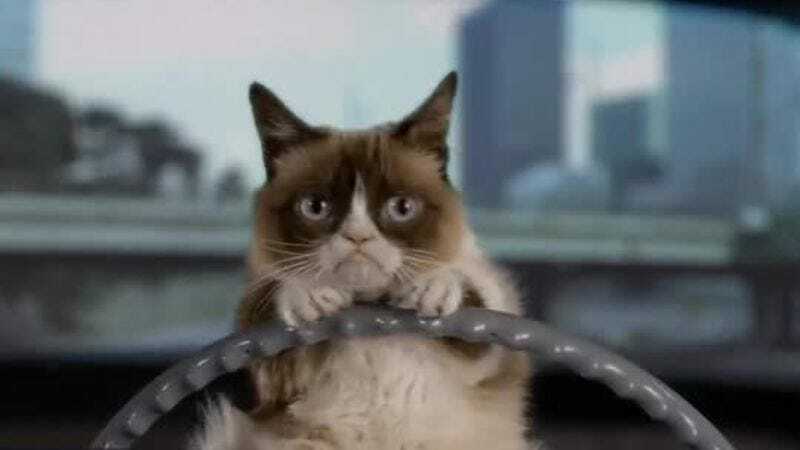 Not since Grumpy Cat’s Worst Christmas Ever has there been such a media event involving Grumpy Cat in some way. Here’s a video of Grumpy Cat sitting for her statue, because none of the above negates the fact that this is still a totally adorable cat, albeit one that nets its owners tens of millions of dollars.